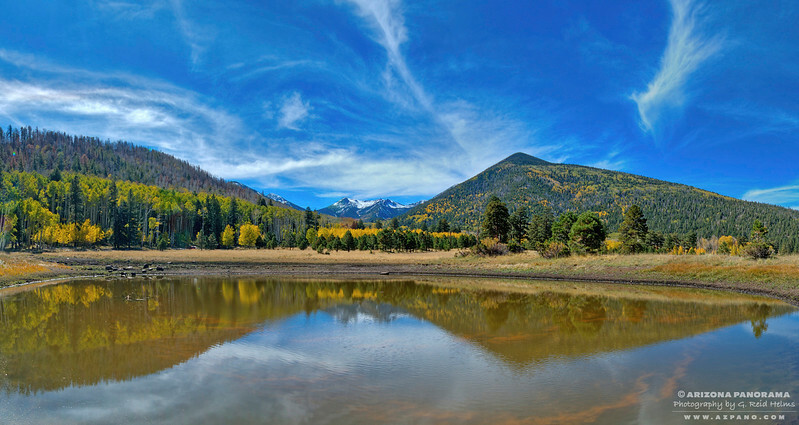 Fall colors line this iconic meadow in the San Francisco Peaks north of Flagstaff, Arizona. Lockett Meadow was a favorite picnicing spot for my family when I lived in Flagstaff as a child. This tank gets lots of love from photographers and artists. A car-load of them missed these beautiful clouds this same day I shot this. It was pretty close to noon when I did shoot this... not usually the best time for photography. I tried not to rub their noses in it. Also interesting to note: Millions of tiny orange diatoms were doing a frenzied dance in the waters of the tank. It was amazing to watch them swirling and boiling in this small patch of water. My pano makes it look huge compared to how small it really is.